I've guess I have always had it "in me" to do caricature. I think it's something you have to be born with. As much as I loved drawing superheros, comc characters, etc. I was always fascinated by the looks and expressions on the faces. I think its due inpart to some of the great warner brothers cartoons I watched. If you watch the old ones from the 1940's ALL of the characters have such rich nuances of expression. It just never occured to me to draw a character without one.I keenly remember everytime Id do draw and expression I could feel myslef literally making that expression myself and trying to "put it into" the picture I was drawing. 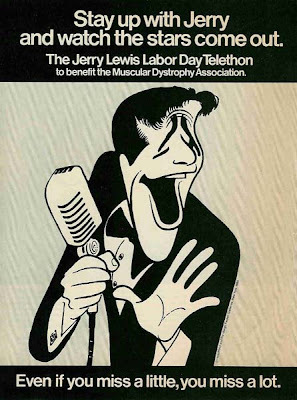 As a kid I used to watch the Jerry Lewis Telethon Every year, not because it was particularly entertaining for me, (even though in all due respect, it is for a great cause) but because of the great caricature logo of Jerry Lewis I used to see from time to time on the show. I was fascinated by the picture and wondered "how does that NOT look like him, AND Look like him at the same time???" I later found out that the picture was done by the "line king" himself, Hirschfeld, and I became an instant fan of his, and picked up everything I could on him. Hirschfeld was the artist to the stars on broadway and his work was constantly featured on playbills, and in the sunday news. I copied line for line his style, happy that I could mimic it a little but still mystified as to how he did what he did. Copying his work did train my had somewhat to do the graceful line quality that Im able to achieve in my pen and ink work. On the other end of the spectrum was an artist called Overton Loyd. Overton was THE only Black Caricature artist/cartoonist that I even KNEW about. His work had that crazy energy that you find in plimpton's animation, and also that "mad magazine-esque quality. Overton's characterization was the perfect compliment to Parliaments lyrics and rhythms and was ahead of its time in terms of marketing and branding. Fro what I understand He even did a few animated shorts back in the day to promote the albums and the personas rapped/sang/played at portrayed in the music. had Clinton come out today with Funkadelic, no doubt there would be clothing, animation, and toys associated with the product.